The Model FHC pickup shown above, the earliest example seen, appears on the front of the 1941 silver catalog. Every DeArmond product – musical instrument pickups, effects units, amplifiers and spare parts – sold to the public through music outlets and distributors was given a specific reference number. These items are listed below, using DeArmond’s own numbering system. The model numbers for other pickups produced for musical instrument manufacturers including D’Angelico, Eko, Epiphone, Emmons, Fender, Gretsch, Bacon Belmont, Guild, CMI (Chicago Musical Instruments), producers of Harmony, Airline, Alden, Barclay, Heathkit, Holiday, Monterey, Regal, Sears-Roebuck, Silvertone, Truetone and others), Hofner, Kustom, Levin, CF Martin, Messenger, Micro-Frets, Ovation, Premier, Rickenbacker and Standel (including Harptone and Koontz) are, with very few exceptions, not generally known. Where known, these numbers are included below. DeArmond did not market any fretted Bass pickups under their own name. The company did not disclose any technical data on their products until the release of their 1980 green catalog No, 80, which included some information on each of their then current pickups and pedals. Unfortunately the iconic models such as the Rhythm Chiefs 1000, 1100, the RHC-B and FHC-C did not appear in this catalog, as they had been discontinued. Two pickups listed below, models 6700 and 6701, were packaged and marketed as Harmony products in Harmony catalogs, but not in DeArmond’s own catalogs or price lists. The Model 6812, a four-scroll (moustache) pickup with a white plastic bezel, was fitted in many Harmony guitars. Another pickup listed below, the much rarer Model 6811, appears identical to the 6812 above. The only difference found between these pickups is the method of securing the pickup itself in the bezel. See elsewhere for detailed photos. Four different heights for the bezel have been recorded so far. These pickups are so named because some existing examples have one or other number stamped on their underside, in addition to the company name. Two pickups listed below, Models FP-6 and FP-12, were packaged and marketed as Fender products exclusively. One version has the edgewise volume and tone controls visible through slots in the pickup’s chrome cover. The other version has the edgewise volume and tone controls visible the pickup’s chrome cover. However, which is which has not yet been clarified. Some re-sellers who produced their own catalogs used their own numbers when marketing DeArmond pickups. For example, Kay’s 1963 catalog shows twelve DeArmond products, including the Model 1000, which is shown as item No. 47385F2650. Model 40 Attachable pickup, chrome-finished with no visible pole-pieces and four black-filled slots, for flat-top roundhole guitar. This is a basic bar magnet pickup, similar to the plain ‘Hershey Bar’ type, positioned within the soundhole and is screwfixed to the front face of the guitar through two tabs (Ouch!). The pickup’s top cover is rivet-fixed through the bar magnet to the pickup’s steel baseplate. A separate V & T (Volume & Tone) open-backed controls box, hardwired to the pickup head, is screwfixed directly into the guitar’s top (Ouch again! ), terminating in a mini-jack socket. The example shown above has two black, cylindrical, tapered knobs and mini-pots with 1/8″ Dia. split chamfered shaft. Model 41 Attachable chrome pickup with no visible pole-pieces and four black-filled slots, for archtop or flat-top guitar. This is a basic bar magnet pickup, similar to the plain ‘Hershey Bar’ type. It has an integral chrome bezel and is screwfixed to the front face of the guitar. This bezel is designed to follow the contour of the archtop body, or sit flat (see photo No. 3 of 3 above). A separate V & T (Volume & Tone) controls box, hardwired to the pickup head, is screwfixed directly into the guitar’s top, terminating in a mini-jack socket. Model 55 Attachable chrome pickup with four black-filled slots and six individually adjustable pole-pieces, for archtop guitar with separate controls box, both screwfixed directly into the guitar’s top. The fixing arrangement is as for Model 41 above. A separate V & T (Volume & Tone) controls box, hardwired to the pickup head, is screwfixed directly into the guitar’s top, terminating in a mini-jack socket. Model 55-FB-12 Set of two Model 55 pickups with wiring harness including three pots (Volume, Tone and Blender controls – no switch) and output jack socket. The pots were designed to be flush-mounted into the guitar’s top, with all wiring concealed. The pickup as shown above – chrome bezel, six adjustable pole-pieces; two rivets holding bezel to coil housing; white top area – did not go into production. The illustration above is from DeArmond’s 1965 catalog. Model 55-FB-7 Model 55 pickup with wiring harness including separate V & T controls and output jack socket, as manufactured. The V & T controls were designed to be flush-mounted into the guitar’s top, with all wiring concealed. Model 56 Attachable chrome pickup with four black-filled slots and individual pole-pieces, for flat-top roundhole guitar with separate V & T controls box, both screwfixed directly into the guitar’s top, terminating in a mini-jack socket. Model 60 Tremolo pedal, without serial number (120 Volts electrical supply required). This example has the same knobs as shown in Rowe-DeArmond’s 1948 Leaflet. Two images above courtesy of liveauctioneers.com and Guernsey’s, New York (B0600). Model 76 Attachable chrome pickup for banjo, with separate V & T controls box secured with elastic straps to the edge of the banjo. This pickup’s coil housing is very similar to the Model 40 above, but without the embosssed ‘DeArmond’ name. Model 100 TFS-100, Tremolo foot switch, incorporating an 8-foot connecting cable with a standard jack-plug. One of these was supplied with every amp produced by DeArmond, including those sold by CF Martin. For more information, see ‘deArmond Tube Amps’. Model 100 TFS-100R, Tremolo foot switch as above, but with miniature phono plug. Model 200 – There is no such DeArmond pickup. DeArmond produced the model 2000 pickup as used by Gretsch (who named it the Dynasonic Fidela-Tone), Guild, Hofner, Levin, Premier and many others. The Model 2000 was referred to incorrectly as a 200 in some discussion groups and as a result, that name has unfortunately gained undue credence. Model 210 Attachable chrome pickup with adjustable pole-pieces and recessed edgewise volume controller for roundhole flat-top guitar. One example of this pickup has been seen with a self-adhesive plastic woodgrain finish. Model 220 Attachable chrome humbucker, 1st version, with integral volume controller, for roundhole flat-top guitar. The two fixing arms on the pole-pieces side are spring-loaded and the third arm has a collet which is tightened manually to set the pickup in position. This was Rowe DeArmond’s first humbucker and at 2.92″ x 1.517″ (74.18 x 37.54 mm.) has different dimensions than other humbuckers. 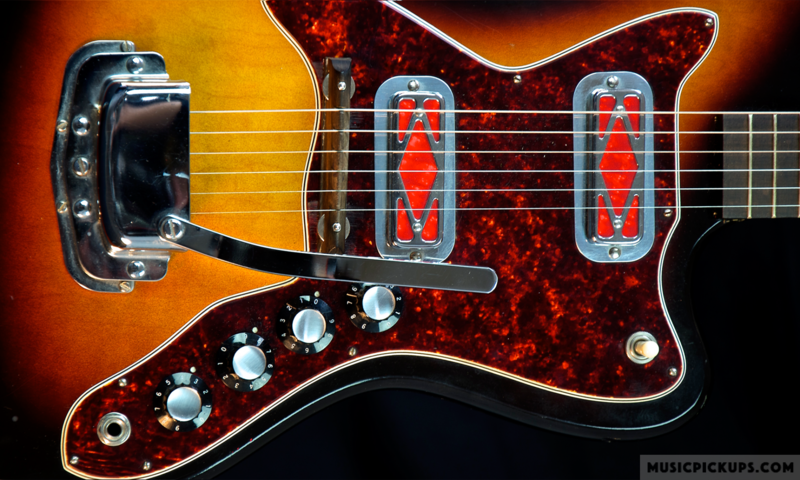 The company’s subsequent humbuckers – Models 2200, 2300 and 2400 – were all slightly narrower and longer, at 2.756″ x 1.549″ (70.00 x 39.28mm.) It should be remembered that this pickup was produced at a time when ‘standard dimensions’ for these items did not exist. Model 220-C as model 220 above but with side-mounting jack and quick-disconnect cable. Model 220 Attachable chrome humbucker, 2nd version, with integral volume controller, for roundhole flat-top guitar. Available in chrome or gold finish. The two fixing arms on the pole-pieces side are as before, but the collet was replaced by a spring-loaded arm which makes installation and removal easier. Model 400 Attachable chrome pickup with black insert for archtop tenor guitar with separate V control box and clamp; with black plastic infill; yellowed acrylic conical ribbed knob; asymmetrical pot box; 1/8″ dia. pot shaft; flush pot box lid. Model 500 Attachable pickup for archtop mandolin, 1st version, chrome, with a bar across the black plastic infill. Black chickenhead knob; symmetrical pot box; 1/4″ dia. pot shaft; overlapping pot box lid. The separate pot box and clamp are quite similar to those used with the FH/FHC pickups. Model 500 Attachable pickup for archtop mandolin, 2nd version, chrome, with unbroken plastic infill. white conical ribbed knob; asymmetrical pot box; 1/8″ dia. pot shaft; flush pot box lid. Otherwise as 1st Version above. Model 500 Attachable pickup for archtop mandolin, finished in white, otherwise as 2nd Version above. Model 601 There is no such DeArmond pedal. DeArmond’s Model 60 pedal has been incorrectly referred to as ‘Model 601’ in some guitar magazines. Model 610 Combination volume & tone control pedal. Volume is controlled by up/down movement of the treadle as with other volume controllers (see the lower pot in the above photo). Tone is controlled by sideways movement of the treadle (see the upper twin-gang pot in the above photo). This twin-gang tone control is the same arrangement as in all of CF Martin’s electric guitars fitted with DeArmond pickups). Model 610 Combination volume & tone control pedal without name, 2nd version. This pedal has ‘# 610 VolumeTone Control’ stamped on its baseplate. Model 700 Attachable Transducer with integral volume controller for violin, in original chrome finish. NOTE: The transducer shown above is common to other DeArmond pickups including Models 750 (ukulele) and 800 (Round-hole, flat-top Spanish guitar). Model 750 Attachable Transducer for ukulele in chrome, secured to the instrument by means of clamp and long rubber bands. Model 750-C Attachable Transducer for ukulele in chrome as above, but with integral CRL (Central Radio Laboratories) black volume controller and clamp. Model 1000 Rhythm Chief, attachable pickup for archtop guitar, without adjustable pole-pieces, with separate V & T controls box, in chrome or gold. Early version shown in chrome with overlapping lid on controls box; transparent cylindrical knobs: screw-in cable connector; black or maroon infill on pickup head; long pressure rod and clamp. Short support rod option available later. Controls, as described in their 1954 catalog, include a “Volume , Rhythm Switch and Tone Compensator’. Detail of rod and bracket assembly for pickup Model 1000, Part No. ML-49. Model 1000 Rhythm Chief attachable pickup. Version shown produced for Guild, for their Artist Award guitars but not sold as such to the general public. Volume controller in asymmetrical box; short support arm woodscrew-fixed to neck; white infill on pickup head, engraved ‘Guild Artist Award by DeArmond’; black infill version engraved in white also produced. Model 1100 Rhythm Chief Attachable adjustable pickup with individually adjustable poles, for archtop guitar, with separate V & T controls box as Model 1000, in chrome; long pressure rod and clamp. Short support rod option available later. Model 1100-G Exactly as Model 1100 Rhythm Chief Attachable adjustable pickup above, but with metalwork finished in gold. Model 1200 Attachable pickup for 12-string roundhole flat-top guitar and recessed edgewise volume controller. One example of this pickup has been seen with an adhesive plastic woodgrain finish. The Model 1300 was included in DeArmond cataloges from 1967 to 1983. Model 1604 Pre-amp volume pedal (requires internal 9 Volt battery). Model 2000-4 Set of two Model 2000 pickups (B and T versions) in chrome with black inserts with two volume controls, two tone controls, switch and socket. NOTE: When the Model 2000 was first introduced by Gretsch in 1950, it was referred to as the Dynasonic and later the Fidela-Tone in their advertising literature, but never as such by DeArmond. Model 2400-G, exactly as Model 2400 ‘Superbucker’ above, but with metalwork finished in gold. NOTE: The Piezo pickup head shown above is common to other DeArmond pickups including Models 3010 (transducer for ‘any treble clef stringed instrument’) and 3200 (twin-head transducer and pre-amp for piano & harp). Model 6700 Attachable chrome S-grille soapbar with gold insert, for flat-top guitar, with separate V & T controls box. The difference between this pickup and Model 6701 is that the fixing bracket is offset as with the Model 40, for fixing in the roundhole of a flat-top guitar, whereas the bracket is flat in the 6701 for fitting onto an archtop body. Model 6701 Attachable chrome S-grille soapbar with gold insert, for archtop guitar, with separate V & T controls box. This pickup differs from the Model 6700 above, in having no semi-recessing offsets in the long fixing bracket. It was designed to be screwed to the top of the guitar body. Models 6811 and 6812 Four-scroll chrome guitar pickup with white bezel, supplied only to CMI (Chicago Musical Instruments), for their range of Harmony guitars. These two pickups do not appear in any DeArmond literature. The only difference between the quite rare 6811 and the more common 6812 may be a difference in the two fixing screws holding the pickup in the bezel. Four different heights for the bezel have been recorded so far. These pickups are so named because most existing examples – a four-scroll (moustache) pickup with a white plastic bezel – have this number stamped on their underside. Clicking on the underlined links will provide more information. 390-00070-90 There is also an optional short offset rod used to fit the Model 1000 Rhythm Chief and model 1100 directly to the guitar’s neck. This rod can also be used to attach the FH series to the neck. Although this item was first produced in the 1950s, the first time it appeared as a separate item in DeArmond’s sales literature is in about 1975, in their orange catalog. The item numbers given are 390-00070-90 for chrome and 390-00071-90 for gold. FH ‘Guitar Mike’ pickup, 1941 – front. FH ‘Guitar Mike’ pickup, 1941 – back. FH ‘guitar mike’ pickup, from 1941 catalog. Model FH Attachable chrome ‘Guitar Mike’ for archtop, firstly with no slots, later with one slot infilled in black. At least six versions of this pickup were produced. Note the ‘hook’ arrangement which attached to the 6th string behind the bridge. This arrangement pre-dated the ‘master clamp’ attached behind the bridge. The wire on the 1st string side of the pickup pre-dates the metal tab seen on all later models. The wire itself is an extension of the chrome ‘spring-like’ cable protector seen on all early FH and FHC pickups. Early FH ‘Guitar Mike’ pickup pressure rod and clamp detail. FH ‘Guitar Mike’ pickup no slots, with chrome cable protector and side tab. FH ‘guitar mike’ pickup with two slots, black rubber cable protector and metal tab. Model FHC-C Attachable chrome pickup for archtop, as above but with full Patent No. 2,455,046 shown. This Patent was granted on November 30, 1948. FH ‘Guitar Mike’ pickup pressure rod and clamp detail, with two milled edge ‘waisted’ screws. MA-5, CF Martin’s in-house name for the pickup range manufactured for CF Martin ref. ‘The Electric Guitar’ by Donald Brosnac. Model Stringtone bridge-mounted lever-operated tuning changer for Hawaiian guitar. Photo 1: Three pressure rod and bracket assemblies together, for comparison. Photo 2: This bracket (at top in Photo 1 above) is an early version for FH and FHC guitar pickups. Two round-head slotted screws are screwed into threaded bracket which is secured by the two slotted nuts shown. Photo 3: This bracket (middle item in Photo 1 above), Part No. ML-49, is final version of FH, FHC-B and FHC-C guitar pickups. The two milled-edge thumb screws hold the clamping strip in place. Photo 4: This bracket (bottom item in Photo 1 above), ML-51, is for Model 500 Mandolin pickup. A second version of this bracket with a slightly longer pressure rod is used with Model 400 Tenor guitar pickup. Notes: The rod bracket assemblies nos. ML-49 and ML-51 listed above, each comprise a rod (referred to as a ‘pressure rod’ by DeArmond), with a threaded tab attached, and a separate punched metal strip with two small thumbscrews. The pointed end of the rod is inserted in the pickup head and the tab on the other end of the rod is clamped to the instrument’s strings behind the bridge. The diameter of the ML-49‘s (Archtop pickups FH, FHC, FHC-B, FHC-C) rod at 1/8″ (3.175mm.) is greater than the ML-51‘s (Tenor guitar model 400 and Mandolin model 500) rod at 3/32″ (0.093mm.) so they are not interchangeable. In DeArmond’s literature, the rod assembly is sometimes referred to as pressure rod or tension rod and master clamp. It is often referred to as a ‘Monkey on a stick’ by collectors and users, but never as such by DeArmond. There is also an optional short offset rod used to fit the Model 1000 Rhythm Chief and model 1100 directly to the guitar’s neck. This rod can also be used to attach the FH series to the neck. Although this item was first produced in the 1950s, the first time it appeared as a separate item in DeArmond’s sales literature is in about 1975, in their orange catalog. The item numbers given to it are 390-00070-90 for chrome and 390-00071-90 for gold.